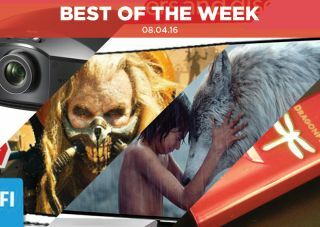 Best of the Week: Apple iPhone SE, Sony & Panasonic 4K HDR TVs and more | What Hi-Fi? This week Sony announced a new compact projector and AudioQuest revealed two new DragonFly USB DACs. In terms of reviews we had two 4K HDR TVs, the Sony 55XD9305 and the Panasonic TX-65DX902B. We also got our hands on Apple's iPhone SE. The May issue of What Hi-Fi? hit online and newsagents this week and it features plenty of reasons to get on the 4K train. There are reviews of 65in 4K TVs, a feature on what lies ahead for 4K and a comprehensive review of Panasonic's DMP-UB900 4K Blu-ray player. Elsewhere there are reviews of hi-res download sites and, if you're an iOS user, a how-to guide on listening to hi-res music on your iPhone et al. You can read all about it here. MORE: The 10 most popular reviews on What Hi-Fi? Sony has introduced the HW45ES projector, which is the successor to the HW40ES. The new compact projector will benefit from technology in the company's flagship models, with Sony claiming it will deliver "better brightness, contrast and resolution" than its predecessor. It's set to go on sale in May and will be available for around £1800. Two new upgraded models of AudioQuest's Award-winning DragonFly DAC are on the way. First revealed at CES 2016, the DragonFly Black (£89) and the DragonFly Red (£169) are said to boast better audio quality, lower power consumption and compatibility with both Android and iOS devices. The DragonFly Red will eventually replace the DragonFly v1.2 later this year. "This slimline 4K HDR TV is a technological tour de force"
Plenty of 4K HDR (High Dynamic Range) sets are now hitting the market, and if they're anything like what Sony has rustled up with the 55XD9305, we're in for a treat. From the start we notice that while other sets can ultimately go darker or brighter than this Sony, we haven't seen a set this subtle in terms of colours. It makes for some strikingly natural skin tones and and is a joy to watch. This Sony may not immediately show off the difference HDR can make, but stick with it and it will reward you big time. "The flagship fight has begun, and Panasonic has come out swinging hard." After the home run that was the DMP-UB900 4K player, Panasonic is in confident mood and that's no more evident than with the TX-65DX902B 4K HDR set. It's a big set – so you will need a big rack to put it on – and a formidable one that boasts superb HDR performance. Lush colours are complemented by deep blacks and bright whites that make for great contrast. All-in-all it's another very impressive effort from Panasonic. "The iPhone 5SE looks and feels nigh on identical to the 5 and 5S"
Apple's latest iPhone is smaller than previous efforts, but is it better? Not really. Size may not always matter but with this iPhone, which has shrunk down to a 4in screen, compromises are evident in terms of audio and the screen contrast. If that doesn't faze you then the SE is still a sterling effort, offering several improvements over older iPhones. Just don't expect the next best thing.